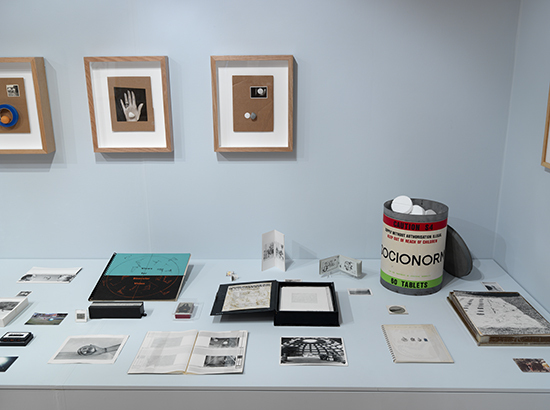 Thinking Through Things is a curatorial collaboration between artist Patrick Pound and the Flinders University Art Museum, drawing on FUAM’s holdings in Australian conceptual or ‘post-object’ art—documentation and ephemera from the 1970s when artists staged events, actions, interventions and performance art works which may have faded from memory but for their documentary traces. The poetic idea or provocation which inspired the original act, and not the material object, was what typically mattered in conceptual art. Pound’s practice is as a hoarder and arranger. His own contributions—subtitled Circles Spheres Mirrors and Holes, after characteristics which define exclusion or inclusion—were sourced online. Nevertheless, they are resolutely analogue: faded photographs and snapshots, newspaper reports, mundane monochromatic objects (plastic balls, rolls of tape). 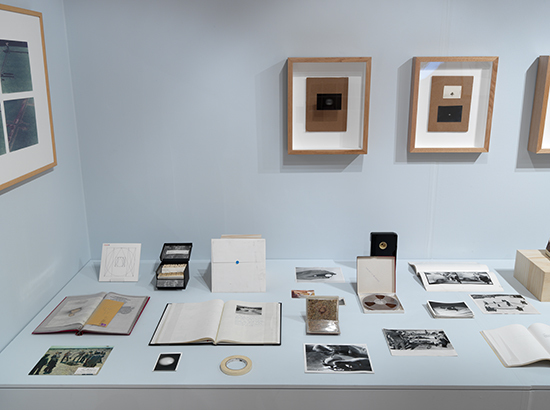 The exhibition is laid out horizontally in three bands: two discontinuous rows along a waist-high shelf set against a long wall, then above a row of framed displays featuring one or two scrappy photographs mounted on a square of brown cardboard resting within an unpainted wooden frame. The top of the frames produces a continuous line slightly above eye level, which binds the collection. These horizontals rest between wings produced by walls at either side, on which an additional four mounted images are placed. 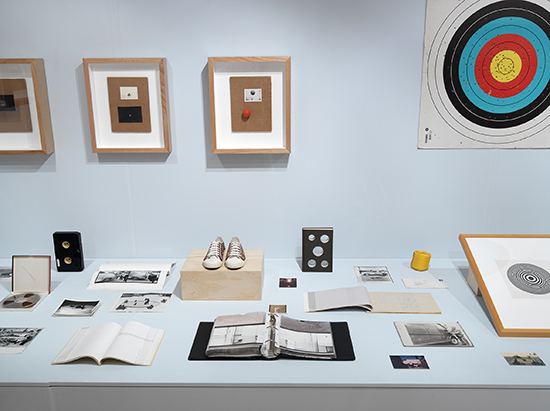 There has been a trend in the last 30 years regarding the exhibition of conceptualist ephemera towards what one might almost describe as a deliberately overstated rustic formalism: planed wooden benches, carefully arranged photobooks and magazines in vitrines designed to look inexpensive but elegant. Pound ironically provides a formal and plastic unity to the objects, suggesting an altogether more material and tangible effect than the original artists intended. Pound notes his interest in how these ineffable events left material traces: “It’s called Post-Object art but they are all objects, so no matter what we do, we end up with things”. Considered in this light, the exhibition is redolent with pathos. I felt a melancholy twinge in seeing these enigmatic residues reduced to simple matter. Like the photographs which accompany them, the contents of FUAM’s collection have a rich contextual backstory. This history has however been almost wilfully stripped away and aestheticised. Instead, one approaches the objects as Surrealist readymades or sources of chance encounters. I pored over Bob Ramsay’s fascinatingly opaque bound collection of photographs of banal domestic corners (Sites and Situations, 1974), for example. But largely, these documents appear lost and abused—much as when Marcel Duchamp proposed a “reciprocal ready-made,” using a Rembrandt painting as an ironing board. Notable here is the inclusion of a recording of a 1980 National Gallery of Victoria survey of video art, as well as reel-to-reel tape of Peter Kennedy’s But the Fierce Blackman (1971). Conforming to Pound’s wilfully abstract rule, tapes are here aligned with plastic balls resting alongside Jãnis Nedêla’s sculptural Bolter No. 5 (2005; a found hard cover book drilled through with holes) and John Baldessari’s Brutus Killed Caesar (1976; its pages display a pair of flanking politicians gazing at a roll of tape floating between them), for the sole reason that the central spools about which the tapes are wound are circular. Visitors will not—cannot—hear what is recorded. As an archivist, I can only be mournful standing before tape rendered mute, its voices and secrets imprisoned within dumb matter. This is not to say Pound is not generously playful, offering moments of joyous revelation. 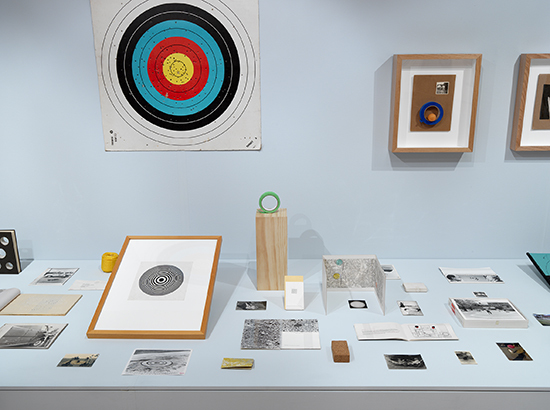 Three axes to the display are provided by cardboard squares from Bob Ramsay’s An Archery Piece (a conditions and distribution activity in collaboration with the Adelaide Archery Club Inc) (1974), in which the glowing coloured rings of a target, and the shaped distribution of holes across it, make up three art works. In the centre of the main wall, at the line of Pound’s photographs, is the front of the target, while each of the wings shows the cardboard backing. Names and scores have been neatly laid out across the latter: evidence of a previous existence as scorecards. Throughout and among these handmade markings emerges a ghostly, spherical collection of pricks. This revelation of past use later violently reinvigorated is a metaphor for Pound’s own intervention. It recalls a signature telekinetically stabbed out by occult forces. That which we could not see before has been magically revealed. Elsewhere, newspaper reports and photographic documents offer wryly compressed narratives: an image of a hole in the road into which a man fell, or a black and white photograph of a helmeted inspector beneath a perforated, concrete dome looking like a modernist visionary bathed in light. These items are hopeful, suggesting possible recuperation. Patrick Pound’s appropriation is affectionate, but it is tinted with sadness at these once brimming documents falling into an abject state of pure thingness.